Our first afternoon of football and it was played on an unseasonal hot day in very high humidity. It resulted in players being fatigued early and the ball turning into a piece of soap due to body sweat. A rare off day by Reynolds with the boot put pressure on the team as it kept Manly in the game and with a few key drop balls, one of which resulted in 6 points allowed them to steal the game in golden point. It's back to the drawing board for another tough game this week and we head up into heat of Queensland. Still 11 more wins to qualify for the semis. The versatity of Kyle Turner is proving a godsend as we have a run of injuries in the backline. With three centres out, Kyle has had to fill in out wide a few times during this season and now finds himself back in the starting 13. He continues the long road back from his neck injury. It's been just under two months since Hawkins left the field in the RTR match late in game with an ankle injury. He finally makes his long awaited return this week, which should help provide direction for the team as we head over to New Zealand. U20s have finally clicked and what a performance as they blew Manly off the park. The return of Josh Cook from his long term injuries has been a breath of fresh air. He has scored 4 tries in two weeks back in U20s and it won't be long before he will be pushing for higher honours. U18s season has come to a disappointing end. Too many close losses have led to the team missing the finals this year. But there is a lot of potential within the ranks. Top try scorer was Mamouzelos with 8 tries and the Top point scorer was Zampech with 60 from 5 tries and 20 goals. We are already seeing two players push into U20s with Stowers and Gale on the bench this week. Special mention to Aldridge, who has been electric at the back. Suaalii continues to impress at fullback. This week in our big win has scored another two tries. He is our first player to 10 tries for the season. He continues to lead from behind and it vital in our plans to try and win the U16s comp. A unlucky loss by our girls, but our prop Moniqca Moa'le continues to impress and scored a double this week and made the NSW Women's team of the week. Golden Point continues to blight on the game. We had 3 golden point field-goal-athons, which almost every normal rugby league fan is getting sick of. We need to revert back to standard 80 minute games, especially after the recent time off policy for conversion kick. We are moving into dangerous player safety concerns, and not to mention in abnormally effects the competition. During the regular season there is nothing wrong with a draw. When teams know they only have 80 minutes instead of 90 they will do more to try and win games before the 80 minute mark. The 7-tackle set after a missed field goal just makes a mockery of the Golden Point period. For finals all teams a seeded as they enter the finals. If we are even after 80 minutes play 10 minutes each way of extra time. If still even then the higher RANKED team should be used to declare the winner. For weeks 1 & 2 ranking is based upon competition table. While Weeks 3 & 4 winners of week 1 are ranked highest then competition table. Statistically it was a typical hot weather game. Completion dropped to 73% from 80% last week. Errors increased to 12 from 11 last week. We gave away 6 penalties compared to 1 last week. Souths Effective 1st tackle dropped but still in a good level of 28.5m from 25.3m last week. Our missed tackles were at a poor level of 37 missed tackles from 18 last week. Opposition offloads improved to 8 from 16 last week. Looking at our left side defence - Graham-Gagan/Turner-Walker-Sutton/Lowe (0-4-2-5) was dropped to 12 missed tackles from 8 last week. On the right side CAllan-Gagai-Reynolds-SBurgess/Turner (1-4-2-3) was dropped to 10 from 6 missed tackles last week. Ruck defence TBurgess/GBurgess-Cook-Tatola/Nicholls-Murray/SBurgess (7-3-2-2) was dropped to 14 from 4 missed tackles last week. Our go forward improved to 1793m from 1731m last week. Tatola, Murray and Graham made 10+m per run. 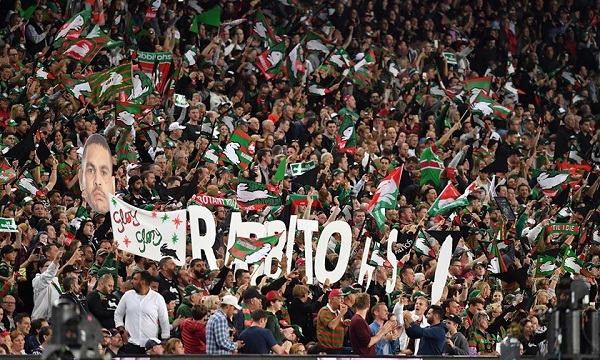 Sam Burgess, Murray, Tatola, Nicholls, Cook, George Burgess, Johnston, Gagai, Graham and Corey Allan making 100+m in the match. Defensively Cook was our best in the tackling raking up 47 tackles. Only Graham didn't miss a tackle.